Apparently the most controversial point, or one of them, was the criticism of the Crusades. In part the president said, "Lest we get on our high horse and think this is unique to some other place, remember that during the Crusades and the Inquisition, people committed terrible deeds in the name of Christ." Most people apparently are willing to give him the Inquisition, but not everyone is on board with the criticism of the Crusades. A couple of points, one literary and one dealing with history. 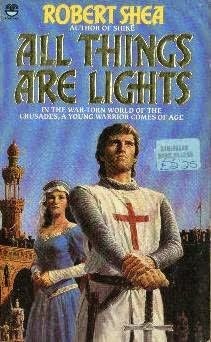 But what I wanted to remark upon here was that although Shea was an American and thus a western writer, the book doesn't take the kind of "rah rah" tone toward the Crusades that many readers might expect. The hero, Roland, is drawn against his will into the "crusade" against the Cathars in France and later into the Seventh Crusade. Roland believes these expeditions are crimes rather than anything to celebrate, and he also believes that all religions basically have the same amount of truth and falsehood (an opinion that he of course is wise enough to keep to himself). I have a lot of books to read, but I might re-read this one sometime this year. As for the Crusades, I must confess that I've never been able to understand why they are singled out as a particular example of violence by Christian nations. After all, all of the lands that were targeted by the Crusades, including what is now Israel, Syria, Turkey, and Egypt, were once firmly Christian, had become Christian largely though not entirely through peaceful means, and became Muslim lands through Muslim crusades (or jihad.) The Muslim attacks were pure examples of conquest for the sake of taking other people's land and advancing a religious ideology. The Crusades can reasonably be described as acts of self defense against Muslim aggression. The First Crusade, for example, was launched after an appeal for help from the emperor of the Eastern Roman Empire, who was hard-pressed by the Turks. Muslim attempts to conquer Europe lasted for hundreds of years, with the last major campaign the Siege of Vienna in 1683. Yes, there were many atrocities committed by the Crusaders and many Crusades seem like pointless acts of military aggression (the Seventh Crusade is a case in point.) Still, it's as if a critic of U.S. foreign policy chose to write an essay about the United States as an imperialistic military aggressor, and as an example selected the invasion of Normandy, France in 1944. Your thesis might be largely correct, but your choice of an example would be odd, as it would have to ignore everything that had happened in Europe from about 1936 onward. I am also wary of how convenient it is to condemn actions that took place hundreds of years ago. The Crusades were arguably acts of self defense, and the earlier ones, at least, may have delayed the advance of Muslim armies into southeast Europe. What reasonable self-defense argument can be advanced for all of the deaths the U.S. caused in Vietnam, or in Iraq? Or, for that matter, the deaths that are the result of Barack Obama's current bombing campaign in Syria and Iraq?